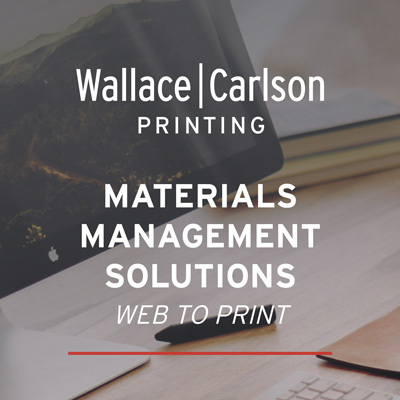 Wallace Carlson offers both a fully-automated bindery services and a hand finishing service for those jobs requiring special handling. From high volume to short runs we have the people and processes in place to fulfill your needs and meet the highest standards of performance. Binding: Various options are available to keeping your pages in order and can add a professional or elegant feel to your project. Die Cutting: Custom or standard die cut shapes can be used to enhance your printed materials. Embossing: Stamp a custom image, logo or text in relief (raised above the paper surface) on your printed materials. Foil Stamping: Add flare and turn heads by using our foil stamping capabilities on your project. Folding: We’ll save you time and energy and fold your project quickly and efficiently. Laminating: Film lamination can protect your materials from wear and tear. Hand Assembly: We can assemble your promotional materials, saving you time and energy. Perforation: Creates a removable, tear-off portion of your printed material. Scoring: For easy paper folding, scoring creates a clean crease. Variable Data: Add sequences of letters and numbers, names and address, or even unique promotional codes to your materials. Shrink Wrapping: Wrapping your print products can make for easy distribution and protection.